﻿Welcome to the London Rangers Hockey Club! 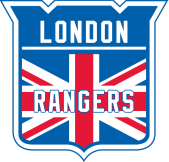 ​Welcome to the London Rangers Ice Hockey Club! We are a rec. hockey team that plays weekly in North London (Alexandra Palace) and travels several times a year to tournaments. Please take a look through the website and see what the Rangers are all about. Our roster is pretty full for this season but if you are interested in becoming part of the club, please see the contact page and send us your details. The formal jargon: The London Rangers Hockey Club is an EIHA registered recreational men’s ice hockey team & play out of the Alexandra Palace ice rink in north London.